Definition at line 156 of file DominanceFrontier.h. Definition at line 38 of file DominanceFrontier.cpp. Definition at line 63 of file DominanceFrontier.cpp. Definition at line 53 of file DominanceFrontier.cpp. Definition at line 164 of file DominanceFrontier.h. Definition at line 165 of file DominanceFrontier.h. References llvm::DominanceFrontierBase< BlockT, IsPostDom >::dump(), llvm::DominanceFrontierBase< BlockT, IsPostDom >::print(), llvm::DominanceFrontierBase< BlockT, IsPostDom >::releaseMemory(), and runOnFunction(). Definition at line 58 of file DominanceFrontier.cpp. References llvm::DominanceFrontierBase< BlockT, IsPostDom >::print(). 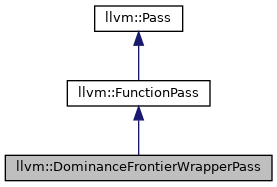 Definition at line 43 of file DominanceFrontier.cpp. References llvm::DominanceFrontierBase< BlockT, IsPostDom >::releaseMemory(). Definition at line 47 of file DominanceFrontier.cpp. References llvm::ForwardDominanceFrontierBase< BlockT >::analyze(), and releaseMemory(). 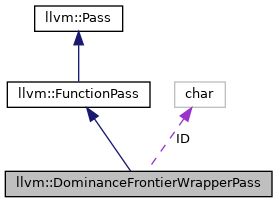 Definition at line 160 of file DominanceFrontier.h.